SoftEther VPN Server can be used for non-VPN purpose. By using SoftEther VPN Server you can use the Delay, Jitter and Packet Loss Generator to simulate a bad-condition network. You can define two Local Bridges from a Virtual Hub toward two physical Ethernet network adapter. Then both two Ethernet network segments are bridged through the Virtual Hub, and the Virtual Hub inserts delay, jitter and packet loss while forwarding Ethernet frames. The Delay, Jitter and Packet Loss Generator is very helpful to test VoIP devices. In order to test your Ethernet-based network topology you can utilize SoftEther VPN Server, Client and Bridge. SoftEther VPN can create several separated Ethernet segment by just clicking. SoftEther VPN Server has Virtual Layer-3 Switch Function which provides Layer-3 IP-based routing between L2 segments. 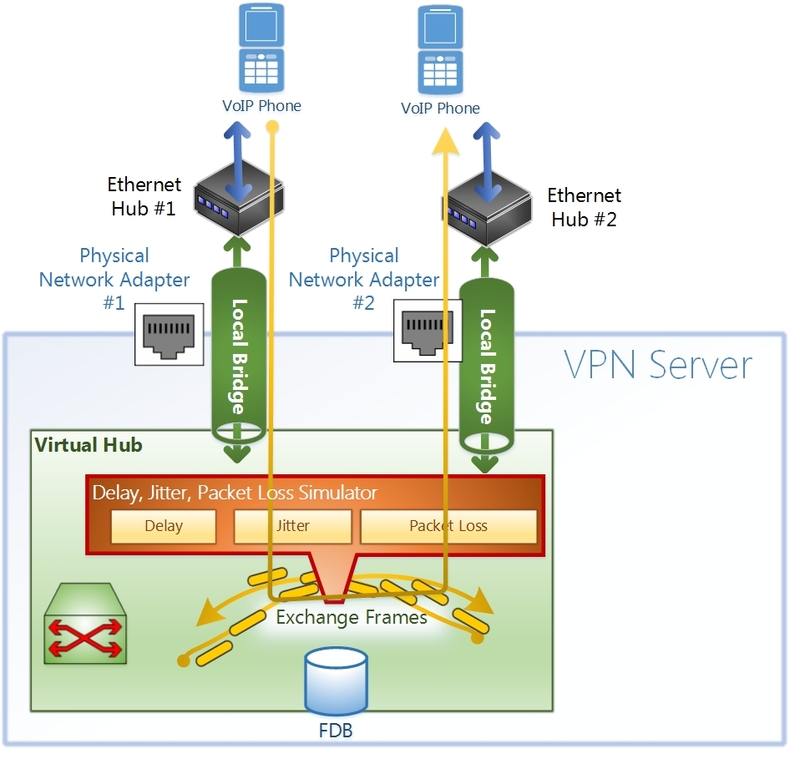 Virtual Hub has Access List Function for packet filtering. These L2 and L3 functions of SoftEther VPN Server are convenient to test your new network design as a field test.